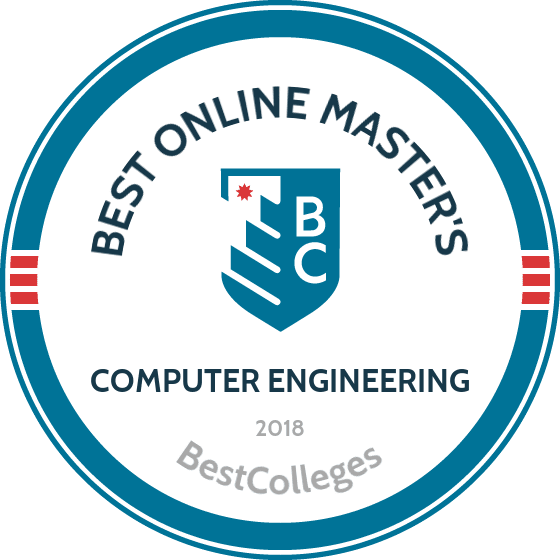 What Are The Best Online Master's in Computer Engineering Programs? What Else Can I Expect From an Online Master's in Computer Engineering Program? A master's degree in computer engineering provides graduates with a competitive edge in the quickly evolving computer industry. According to the Bureau of Labor Statistics, the demand for computer engineers will increase as more industries incorporate electronic elements, devices, and internet platforms into their products. Computer engineers stand at the forefront of innovation, capable of working across multiple fields with a broad range of software development. An online degree in computer engineering prepares you to enter this dynamic field. The internationally recognized College of Electrical and Computer Engineering offers an online computer engineering master’s via its distance learning program, UF EDGE. The 30 credit master’s of science in computer engineering consists of ten classes does not require a thesis. Courses for this degree are offered during the fall, spring, and summer terms, and the program can be completed in 24 months. The affordable and convenient curriculum is ideal for adult learners working full time or with other personal responsibilities. Admission requirements for online engineering students are the same as the on-campus program. Applicants are admitted from a variety of undergraduate majors including chemistry, mathematics, physics and various engineering and technical fields. Online students take the same curriculum as UF’s on-campus students, and receive the same diploma. Georgia Tech has been a leader in professional education for over three decades. Its electrical and computer engineering -- online degree (MS) offers working professionals an affordable and flexible distance learning program. The master's degree consists of the same courses taught by the same professors on campus; courses are digitally recorded and made available for download at the student’s convenience. Course delivery is through T-Square, which features an online space for assignments, projects, lecture and lab videos, and all other class-related content. The master degree for computer engineering is 30-38 credits, and most students finish in three to five years. Students admitted to the degree usually hold their bachelor’s in electrical or computer engineering, physics, computer science or other disciplines related to engineering. Applicants with degrees in other fields may be required to take undergraduate courses in electrical and computer engineering before beginning their graduate work. John Hopkins University has offered distance learning options since 2001. Its part time master’s of science in electrical and computer engineering is for students who work full time. Three flexible options are available: a fully online option, a combination of online and on-campus courses, and an evening and weekend on-site program available at six Washington, D.C. and Baltimore locations. The online degree requires 10 courses in communication systems, computation, power generation, information transmission, measurement, and control. Each online course is made up of 12 to 14 learning modules -- the equivalent to one week of instruction in a traditional course. The computer engineering online degree allows students to customize their schedule according to their work and personal needs, moving from online to on-site courses or combining both formats in one academic term. The degree must be completed within five years. The University of Virginia’s master’s of science in computer engineering, offered in partnership with the Virginia Commonwealth Graduate Engineering Program (CGEP), provides working professionals with additional graduate training in the field. Courses are offered in synchronous, real-time formats; asynchronous offerings are also available, depending on the course and the instructor. Course delivery is through Blackboard Collaborate, and students are encouraged to take most of their courses in real time to maximize student-faculty interaction. The online degree requires ten courses or 30 credits, and can be completed in five years. Up to five classes may be taken through one of the CGEP partner schools, which can shorten the time needed to finish the degree. Most applicants to the computer engineering degree have received undergraduate training in electrical engineering, but those with undergraduate majors in applied science, physics, and other engineering fields may also be considered. North Carolina State’s master’s of science/computer engineering is designed for students with an undergraduate degree in engineering. The fully online computer engineering degree focuses on networking, VLSI systems, and computer architecture and systems. This is a course-only program with no thesis requirement. Course delivery is through NCSU’s WolfWare learning management system, which provides flexibility to adult learners who are working full time or have other personal obligations. All incoming students are assigned to an academic advisor to help them develop an individualized plan of study and assist them with online course selection. The master’s degree requires 30 credits, and new students are usually advised to limit their first semester load to one course. Part time students take three or six credits per semester, while full time students enroll in nine hours. Students must complete all requirements for the degree within six years of their first course. NYU’s School of Engineering is recognized nationally for its innovative online instruction. The master’s of science in computer engineering prepares graduates for positions in the growing fields of telecommunications, computer networks, and microeconomics. Coursework features topics such as computer networking, VLSI design, embedded systems design, and computer architecture. The 30 credit curriculum has a strong focus on the design and integration of both software and hardware components and systems. NYU offers a rolling admission, and students can enroll in courses in the fall, spring, or summer semesters to earn their degree within 18 months. Courses are delivered asynchronously, with students able to access lectures, assignments, and other course materials 24/7 according to their schedules. The curriculum consists of three credits of algorithms, 12 credits of core computer engineering electives, 12 credits of general engineering electives, and a three-credit capstone project. The computer engineering master's degree at Stevens Institute of Technology provides a comprehensive online learning experience in hardware and software development. Two degree options are available: the master’s of science in computer engineering requires 10 courses and a master’s thesis to complete the degree; conversely, the master’s of engineering does not require a thesis. Applicants must have a bachelor’s degree in electrical or computer engineering to be considered. Students with undergraduate majors in other engineering disciplines, mathematics, or physics must complete prerequisite courses to be admitted. Several concentrations are available in the online degree computer engineering curriculum, including communications and signal processing, embedded systems, robotics and control, microelectronics and photonics, computer architecture, networks and security, software engineering, and data engineering. Classes are offered in both synchronous and asynchronous formats through the WebCampus course delivery system. Depending on the subject matter of the course, instructors schedule real time lectures and presentation as needed. The Illinois Institute of Technology (IIT) is a pioneer in digital education in the sciences. Its computer engineering master’s is a course-only program that does not require a thesis. The 30 credit master’s of electrical and computer engineering can be completed in one year, and the majority of coursework takes place within core electrical and computer engineering classes. Students confer with a faculty advisor to construct a personalized program of study in one or more areas of specialization, including power systems and signal processing, computer engineering, control systems, communication systems, electromagnetics, networks, photonics, electronics, and optics. IIT uses Blackboard as its learning management system; lectures, videos and other course materials can be streamed at any time, day or night, depending on the student’s needs. The master’s of science in computer engineering at Syracuse is a 30 credit program well-suited to working professionals, and those with undergraduate degrees in engineering or related fields wanting to explore new career opportunities in the field. The curriculum integrates theoretical content with real world applications through three online paths: a computer hardware engineer degree track, a software engineer degree track, and a security and assurance systems option. Course delivery is both synchronous and asynchronous, and real time, face-to-face classes are held once a week for each course. All weekly class meetings are recorded and available for review, and course materials are accessible online 24/7. The program also has developed a mobile application that allows students to access all course-related materials from their cell phones. This degree can be completed in 15 months. The University of South Carolina’s master’s of engineering degree in computer science and engineering has been developed for working professionals looking to expand their career opportunities in the fields of computing and information systems. The curriculum covers computer architectures, compilers, and algorithms, and students are encouraged to specialize in subareas that meets their interests and professional goals.The online computer engineering master’s degree is offered through USC’s APOGEE (A Program of Graduate Engineering Education), specifically designed for engineers working full time who have already earned ABET-accredited undergraduate engineering degrees. APOGEE courses are accessed via streaming video in a tri-semester format each spring, summer, and fall. Students receive password-protected access to course lectures and content materials. Online students are also assigned a faculty advisor for course selection and other assistance. Penn State University, a recognized pioneer in distance learning for decades, offers an affordable and fully online computer software engineer degree through its World Campus centralized delivery unit. This specialized program serves the needs of adult learners with undergraduate backgrounds in computer science, computer engineering, electrical engineering, or information sciences, and who are interested in expanding their knowledge and career prospects. The 36 credit master’s of software engineering is a completely asynchronous program allowing students to maintain their employment and personal schedules. Students complete the degree in two years by taking two classes per semester. Courses are delivered via Blackboard Collaborate and Skype, and students advance with a cohort to facilitate interaction and dialogue. Online students are provided with the full range of support services available to students attending courses at Penn State campuses, including technological assistance, academic advising, career counseling, and library materials. Missouri S&T offers a master’s of science in computer engineering through its distance education delivery system. This online computer engineering degree requires 30 credits to complete, along with an optional thesis requirement. Applicants are typically employed full time in the field of engineering, and have already earned an undergraduate degree in engineering from an ABET accredited school or an equivalent international degree. The program’s strengths are in digital systems design, computer architecture, embedded computer systems, computer networks, computer security and computational intelligence. Courses are generally available asynchronously -- recorded and archived for students to access as their own schedule permits. Depending on the class, some instructors may require real time presentations and make these expectations known in advance of enrollment in the course. Students complete the degree within six years, with most students take one to two courses per semester earn their master’s in four years or less. The University of Delaware offers an affordable, flexible, and fully online computer engineering degree for working professionals with a bachelor’s degree in electrical, mechanical or computer engineering, mathematics, or computer science. Graduates are positioned to fill advanced specialist positions in areas like hardware and software engineering, information analysis, cybersecurity, and network systems. The master of science in electrical and computer engineering requires ten courses in the areas of wireless communications, 3G/4G/5G cellular, Wi-Fi, computer networking, signal and information processing, data analytics, and cybersecurity. The 30 credit degree can be completed in two years. Admission is rolling, and students may begin the program in either the summer, fall, or spring terms. Online course are delivered completely asynchronously in seven-week formats, with no on-site requirements. Video resources and course materials may be accessed at any time through mobile phone, computer, or tablet. A leader in distance education for adult learners and working professionals, FIU offers an affordable and fully online computer engineering master’s degree in the rapidly growing and in-demand field of network security. The master’s of science in computer engineering with a concentration in network security offers specialized courses in ethical hacking, forensics, network security, and malware analysis. Professional certifications in Network+, Security+, and Certified Ethical Hacker (CEH) are also available. The 30 credit degree can be completed in only ten months. Students are also required to take 24 credits in computer engineering core courses -- and six hours of math electives -- in six eight-week terms. Course delivery is completely asynchronous via the Blackboard learning management system, and all course materials can be accessed at any time. Applicants to the program should hold an undergraduate degree in electrical engineering, computer engineering, or another STEM major from an accredited school. Colorado State University offers two options for engineering professionals seeking an online computer engineering master’s degree: the master’s of engineering (M.E)-computer engineering specialization, and the master’s of science (M.S.) in computer engineering. Both are non-research, coursework-only programs with no oral examination or thesis requirements. The 30 credit curriculum can be tailored to fit the schedules and career goals of engineering professionals who work full-time. Students work with a faculty advisor to select courses that focus on computer system design and exploration, network programming, internet protocols, and architecture of mobile and warehouse scale computers. CSU has developed an easy-to-navigate course delivery system through its Canvas learning platform. The degree is offered in both synchronous and asynchronous formats, with real-time classes that enable direct interaction through microphone and webcams, and recordings of live courses offered on campus. Both master’s degrees can be completed in two years. Iowa State University’s nationally recognized college of engineering offers a fully online graduate computer engineering degree. The 30 credit master's degree in computer engineering is designed for engineering professionals who desire an advanced degree without leaving their employment. Students typically enroll in one class each semester, and complete all degree requirements in five years. Six areas of focus are offered: advanced electronics and materials; communication, controls, and signals; computing and networking systems; energy systems; secure and reliable computing; and software systems. Courses are delivered asynchronously through either the Blackboard or Canvas learning management systems, which allows students to access lectures and course materials at a time that suits them. Live viewing of on-campus courses in real time is also available. Online courses are not self-paced, and instructors will determine specific assignment deadlines, along with start and end dates for each class. Auburn University’s computer engineering online degree is a course-work only master’s of electrical engineering. The program is designed for professionals looking to enhancement their skills without having to interrupt full-time employment. The 33 credit program can be earned in as little as two years. Most online students take one or two classes each semester, and courses are available any time. Students who are employed full-time typically finish the program in three or three-and-a half years. The maximum time allowed for completion of the master’s degree is six years. Students take at least one class in three of the program’s six research areas: computer systems, electromagnetics, communications, control systems; power systems, and electronics. Online students are all provided with written and video training in Panopto and Canvas, the two learning delivery systems used for graduate study in engineering. The University of Arizona’s online master’s of science in electrical and computer engineering is geared for working professionals who want flexible graduate training with minimal disruption to their employment. Students complete 30 credits and select a specialization that aligns with their interests and career goals. Options include wireless communications and networks, communications and control, digital signal processing, high-performance computing, computer networks, software engineering, artificial intelligence, detection and estimation, holography and diffractive optics, simulation modeling, and heterogeneous systems design. The master degree for computer engineering is offered entirely asynchronously through the university’s Desire2Learn platform. Students access lectures and all class materials at any time, and depending on the course, live lectures of on-campus real-time courses are recorded and uploaded the same day. Support services, online library resources, and 24/7 technological assistance are available. Students can earn the master's in a year and half to two years. One of the best master’s level institutions in the U.S., the University of Michigan-Dearborn offers a flexible and affordable master’s of science in engineering (computer engineering). This 30 credit master degree for computer engineering requires nine credit hours of core courses, nine to 11 hours in specialized technological concentrations, six in professional electives, and four to six hours of electives. Concentrations are offered in computer architecture and design, networks and communications, intelligent systems, and multimedia engineering. Students may earn the degree part-time on campus, completely online, or through a combination of online and campus-based courses. Courses offered on campus are scheduled in the late afternoon and evening to accommodate working professionals and other adult learners. Course delivery for the online degree is fully asynchronous through the Canvas learning management system, and MediaSite captures lectures. The online option is identical to the degree earned on campus, facilitating an integrated and inclusive learning community. The University of Idaho provides two affordable and convenient options for adult learners looking for an online computer engineering degree: the master’s of engineering in computer engineering without a thesis, and the master of science with a written thesis. Both degrees require 30 credits and emphasize digital hardware design, digital systems design, and computer systems. Online course delivery is via the Engineering Outreach portal (EO). Two course formats are offered: live courses uploaded to the EO portal two hours after the lecture has been completed, and pre-encoded classes that were taught and recorded in previous semesters. The format is ideal for working professionals, as courses are fully asynchronous and students are not required to visit campus. Students may take as many as 16 credit hours each semester, and most online students are able to earn their degree in three to five years. A computer engineering degree prepares students to work with technology through extensive training in algorithm design, engineering, and data science. Many programs require students to finish a final advanced project, thesis, or capstone to complete the online computer engineering master's degree. Below, we've listed a few courses commonly found in online computer engineering degree programs. Graduation requirements vary from program to program, but you'll find some iteration of these courses at most schools. Computer Architecture: Students learn computer hardware subsystems, including memory systems, pipelining, run-time optimization, and multiprocessing. The course focuses on hardware design by looking for trends in case studies of current operating systems. Students also learn design strategies fundamental to computer performance and capacity improvement, which students then use in their own projects. Cybersecurity: Computer vulnerability is a growing issue. Vulnerabilities of TCP/IP protocols, routing attacks, and hacking are all covered in this course. Students learn to construct defenses, such as intrusion detection, firewalls, internet protocol security (IPsec), and public key infrastructure (PKI). VLSI System Design: Very-large-scale integration (VLSI) system design introduces students to the VLSI CAD software used for schematic capture, layout, timing analysis, and functionality simulations of integrated circuits. This course includes training in CMOS processing technology, MOS transistor theory, clocking strategies, and input and output structures. Specializations may vary. HOW LONG DOES IT TAKE TO GET AN ONLINE MASTER'S IN COMPUTER ENGINEERING? The length of an online master's degree in computer engineering is dependent on the speed at which the student can work. On average, most students complete the program in two to three years. Many programs enroll students as part of a cohort, which dictates the workload and the length of the program. A cohort also provides a community of classmates with whom students complete most classes. Conversely, some programs offer individual pace learning, where students enroll in the number of courses that fit their lifestyle. Decreasing the recommended number of courses per term will also increase the time it takes to complete an online program. Many programs end with a thesis or capstone project, which normally requires a single term to complete. Accreditation is a crucial part of any program search, as it certifies that a school offers a rigorous and quality education. In computer engineering, no specific accreditation board exists to certify specific programs, so it's critical to make sure that your prospective school has been accredited by an appropriate regional or national accrediting agency. To learn more about accredited schools, download the latest list of accredited institutions from the Department of Education's website. Prospective students can also search the accreditation status of a specific school by name with the Council of Higher Education Accreditation's website search engine. An online computer engineering master's degree opens several fields to recent graduates. Students can transition into hardware or software engineering, or become directors and administrators that guide and orient innovation. The following is a brief list of careers graduates with a computer engineering degree can pursue, along with a description of common job responsibilities. Computer hardware engineers design and develop computer systems and separate components such as processors, circuit boards, and routers. Hardware engineers generate new directions in computer design and work in a variety of fields. A company's security analyst protects the business and its members from cyber attacks. By improving system software, security analysts protect vulnerabilities and enhance business overall. Analysts continually adapt by being aware of security trends so they can enact the best measures to protect their organization. Company administrators of network and computer systems identify, install, and organize the computer systems best suited for a particular company. Hardware and software are the domain of the administrator, whose objective is to maintain and increase productivity. These administrators must interpret and solve problems quickly. The architecture behind computer networks such as LANs, WANs, and clouds require constant innovation and maintenance. Computer network architects design these freeways of communication to serve multiple people and organizations. These network engineers constantly think to the future by predicting and protecting communication pathways. Computer and information research scientists solve complex, data-driven problems by designing new forms of computing technology, and new uses for existing technology. These researchers are integral to the fields of business, science, and medicine, among others. This position requires an additional PhD in computer engineering. Computer engineering salaries are directly related to the level of technical design, construction, and maintenance of hardware and software systems. The following table features data from Payscale regarding the expected salaries of computer hardware engineers, information security analysts, network and computer systems managers, and computer network architects. With the exception of network and computer systems manager, all of these careers show a steady increase in pay into late career. According to Payscale, the average salary for IT management is $84,977. Financing an online master's degree in computer engineering may seem daunting. However, there are countless sources of available funding. The first step is to complete a FAFSA application to determine your eligibility for federal funding opportunities such as scholarships, loans, grants, and work-study. Some companies may pay for higher education if your degree is relevant to the field. Ask your human resources administrators if your company pays partial tuition costs, or offers credit hours for online institutions.